Are you tired of paying exorbitant prices for new sails? Atlantic Sail Traders has the solution. If you do not mind taking a few simple dimensions yourself, you can save a lot of money buying your next set of new sails from us. We are an independent loft, serving sailors worldwide since 1985. The reason we can save you money on new sails is that we are not locked into buying materials from one company at inflated prices, nor do we have to pay franchise fees. Because we are an independent loft, we can shop around and buy the best cloth for your needs at the best price. All of our custom new sails are made from first quality sail cloth, no seconds are used in our manufacturing process. We pass all these savings on to you, our customer. As cruising sailors ourselves, we know what cruisers need in a new sail: durability and performance. 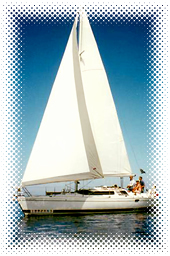 All our custom cruising sails are computer designed and computer plotted to insure good shape and performance. They are all heavily reinforced and built to take abuse. Our sails come with many standard features that other sail makers call extras or only put on their "Blue Water" sails. All our new custom cruising sails come with a two year warranty and a 30 day inspection period. Whether you are circumnavigating your local lake or the world, Atlantic Sail Traders can build you the most reliable sail at the best price. All of our New Custom Cruising Sails come with radial corner reinforcements, triple stitching, leather chafe guards, leech line, draft stripe, telltales and a sail bag. All of our New Custom Cruising Main Sails come with all the standard features listed above as well as four partial length battens with batten pockets reinforced the entire length of the pocket, all the slides you need to attach the sail to the mast and boom, and a heavily reinforced aluminum headboard. All of our New Custom Cruising Hank-on Head Sails come with all of the standard features listed above as well as all the bronze piston hanks you need to attach the sail to the forestay. Our New Custom Roller Furling Head Sails come with all the standard features listed above as well as a foam luff tape (to give the sail better shape when it is reefed), and a wide Sunbrella UV cover cloth. Atlantic Sail Traders has a staff of experienced racing sailors plus the latest technology to bring you Grand Prix performance at affordable prices. Performance sails built at our loft have won countless local and nationwide regattas including Key West Race Week and the Trans Pac. Our computer design and plotting program has been refined for over two decades with feedback from sailors all over the world. Our radial cut sails have shape built into every panel to ensure smooth and continuous airflow over the entire sail. Please contact us with your specifications and we will design a sail that will move you to the front of the fleet at an affordable price. All our New Custom Racing Sails come with a one year warranty and a 30 day inspection period.